Musically this year started for me with the new album by Florence and the Machine which I got for Christmas. I played it many times, often when we had guests. Many of them knew Florence, her previous album “Lungs” and this new one, “Ceremonials”, and an obvious conversation arised numerous times: which one we like better? They said, and I said too, that the new one is better. It’s louder, with more power, more professionally arranged, and the songs and music are more – we couldn’t find the word, but finally agreed on – distressing. But then came this year’s discoveries, Gotye and Lana Del Rey, and I shelved Florence for some time. I returned to her today, as I was reviewing my notes of the best music I heard this year and comparing them with last year’s. 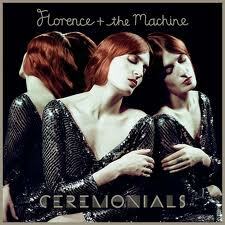 And that’s where the realization came: “Lungs” is, in fact, better than “Ceremonials”. From “Lungs” I chose “Blinding” to be the most awesome song, but there were many close seconds actually. From “Ceremonials”, after half a year of listening to the album, I couldn’t even name all the songs, and only one clearly came to my mind if I wanted to remember the music: “Seven Devils”, and not because it’s best or anything, but because it’s the most unusual of them. And this is the problem with “Ceremonials”. Now I know not only that it’s not better than Florence’s debut, but also why it is so. The songs are… good. They really are. But none of them really stands out, not one really sticks to my mind. “Lungs” had awesome “Rabbit Heart”, thrilling “Howl”, powerful “Drumming Song” and aforementioned, epic “Blinding”. It also had some quieter, but still good songs, like opening “Dog Days Are Over” and a little diamond of “My Boy Builds Coffins”. Even it’s weaker songs stood out, like irritating “Kiss With A Fist”, which didn’t at all fit the rest of the album and sounded more like a strong woman’s rock anthem a’la Sheryl Crow and had no Florence’s folk-rock appeal. And then there’s “Breath of Life”, Florence’s song for the movie “Snow White and the Huntsman”, which I can’t say I welcomed warmly. Not only it appears to be the filmmakers’ trick as cheap as making this movie at all (not only is it another alternative look at the Snow White fable after “Once Upon a Time” and that godawful movie “Mirror Mirror”, but am I to believe Kirsten Stewart is actually a brave woman, not a damsel in distress? Come on.) but also the song sound a lot like… like the one from “Ceremonials”… which one was that… that’s the point. It sounds like ALL of “Ceremonials”. This is the problem with Florence’s second release: too much blandness, too little diversity. Please, bring that back next time. Because I know you are awesome!